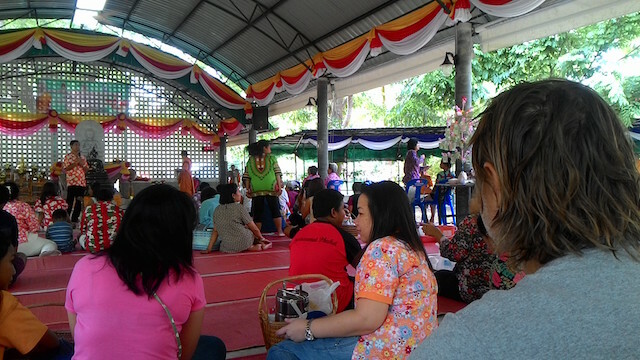 Today we celebrate Songkran, Thai New Year. Thais are smart and love to have fun so in Thailand they celebrate Western New Year, Chinese New Year and their own New Year - how about that! We started from Barnhem at nine o'clock in the morning, well aware that this would be a wet day, in the truest sense. In fact, some were already soaking wet when we left - Wow and Bat - who had started a little before us.We set out to Wat Manik with the car loaded with food to start the day with a more traditional celebration together with our seven novice monks. When we got there, we left the food to the temple and then there was some information before our young monks came with their 114 monk buddies. At first it was a little prayers and chanting, and then it was time to give the monks food. All of us stood in line as they came with their bowls that everyone visiting the temple filled with food. After that was lunch, of course - there is not the feast in Thailand that does not include a lot of food, food is important! Then there was a break after lunch and then we started our water war, initiated by Wow who was wildest of all of us, in other words, we were all soaking wet when it was time to pour water on the monks' hands. Everything started very dignified - the monks sat in a row and all visitors had to go on line to pour water over their hands. 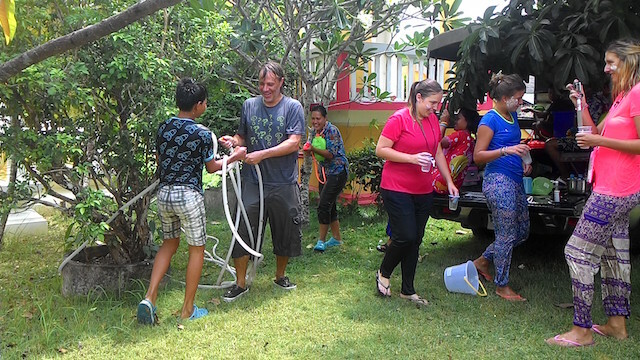 In fact, the continued equally dignified but mischievous as everyone started to poor water at each other. On the way home from the temple the water war continued and Hans was good at really slowing down at all the places along the road where people celebrated, especially if they had ice cold water. So if you think that you can not freeze in Thailand, you are wrong. Now I am at Barnhem writing this while the rest of the gang have continued out for more water wars. I am pretty happy and the same goes for those who continue partying.